Kasauli is a small town in the state of Himachal Pradesh that is located at an altitude of 1927 m. It is at a distance of 77 km from Shimla and 70 km from Chandigarh. The legend of the town states that it came into existence after Lord Hanuman placed his feet here in order to advance on to the Sanjeevani hill. The place where the lord actually kept his feet is believed to be at a hillock which is 300 m high. Historically, Kasauli is one of those hill stations that was developed by the British empire during its peak period in India. 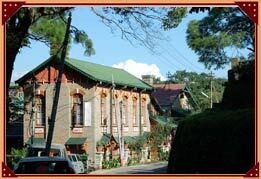 Kasauli is one of those places that despite its beauty is still to find itself prominently on the tourists map. Infact it is very good for all those who yearn to spend some time alone with their family, or for that matter even themselves. If you happen to visit the town in off season (November to February), it is quiet likely that you will not come across any person for very long while on your walk. What will accompany you on your walk, ofcourse, will be the sweet and soothing voice of the birds along with the gentle rustling of leaves. For those who are quiet opposite and look out for fun and adventure at every step, Kasauli will be a disappointment for there is hardly anything to do. There are a bit of small attraction within and around the town that will keep you busy a little. This is the highest point in Kasauli and is the same place where Lord Hanumana is believed to have set his feet while on his way to look for the Sanjeevani herb. 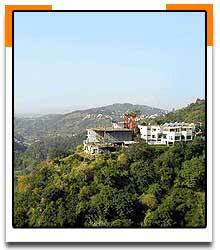 The point is around 4 km from the Kasauli bus stand and at the top of it is a temple dedicated to Lord Hanumana. The temple lies within the premises of the air force base as such there are a few restrictions involved. You are not allowed to carry either a bag or a camera inside. The hike upto the temple can be a bit taxing for those who are not used to climbing, however, it is worth an effort. The views from atop the hill is simply magnificent if the day is clear. You can watch the brilliant sparkle of Sutlej river as it makes it way through the plains and the pure beauty of the snow capped peaks of the Dhauladhar range. This church, situated close to the bus stand, was constructed by the the British family who founded the town of Kasauli itself. The church is a magnificent structure built in the shape of a cross. Set amidst a grove of chestnut and fir trees, the church is a place of worship for around 30 families. Apart from them, tourists too flock this church in large number. Earlier the church was known by the name of Anglican Church. In the year 1970, the church was brought under the aegis of the CNI (Churches of North India). It is currently managed by the diocese of Amritsar. 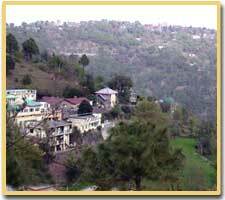 Sanawar is a meagre six km from the town of Kasauli at an altitude of the 1750 m. The place is home to one of the major tourists attractions of the region - Lawrence School at Sanawar. This school was founded by Sir Henry M. Lawrence and his wife Honoria more than a century and half back. The school was initially started with 14 boys and girls, and is today one of the best schools in the country. In between, in the year 1853, the British Empire awarded it with the Kings Colours. This is an honour that was bestowed upon only six schools worldover by the British Empire. Every first week of October, the students of Sanawar celebrate their Founder's Day. This is the only time when the relatively quiet atmosphere of Kasauli takes a backseat. For the rest of the year, the Lawrence School campus (139 acres) provides a wonderful ground to relax. There are pine, deodar and other conifer trees in the campus. You can also take a round of the campus and examine the colonial buildings that till date retain their charm. There is also a chapel in the campus. 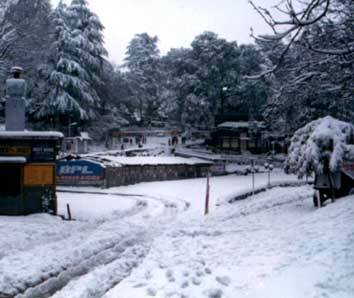 Dharamapur is situated at a distance of around 15 km from Kasauli and is known for its hospital. This hospital is considered one of the best in the country for the treatment of tuberculosis. The fresh air of Dharamapur is extremely relaxing. Visit it to feel a renewed vigour in your heart and soul. Once a favourite haunt of the British families, Dagshai is today very less frequented by tourists. Nonetheless, its freshness is still binding. Infact, it gives you a much more of a 'discovering feeling' than Kasauli itself. Walk around the paths and rest under the canopy of oaks and holly forests, the magic of Dagshai will slowly overpower you. Dagshai is just 19 km away from Kasauli. 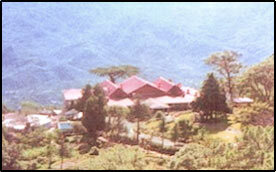 The main attraction here is the Gurkha fort which was constructed in the 19th century. The town was home to the British soldiers during the erstwhile era. The closest airport from Kasauli is in Chandigarh which is 65 km away. From there a cab will bring you to Kasauli. The nearest railhead from Kasauli is in Kalka which is 40 km away. Buses, coaches and taxis are quiet frequent from Kasauli to Chandigarh and Delhi. For those driving from Delhi, take NH 1 to Ambala crossing Sonepat and Karnal. From Ambala, take NH 22 for Kasauli. The route will pass Zirakpur, Panchkula, Pinjore, Parwanoo, Dharampur. From Dharampur, a narrow hill road will take you to Kasauli.